Walker County placed second among Georgia counties in a recent competition to promote the sale of state wildlife tags. Walker County posted a 62% increase in sales during the contest period. Jennifer Wisniewski with Georgia's Department of Natural Resources says the additional sales translate into almost $2,000 in direct support of wildlife. Walker County will celebrate the accomplishment by hosting Wildlife Day from 11 a.m. to 2 p.m. on Thursday, in the lobby of the Walker County Local Government Services building, at 122 Highway 95 in Rock Spring. Some of the animals featured include a bald eagle, gopher tortoise, indigo snake, owl and a hawk. Parents are encouraged to bring their children by the office so they can see the animals up close in a safe environment. 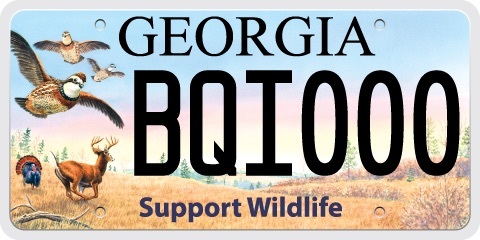 Wildlife tags are the least expensive specialty plates available in Georgia. The upgrade costs $25 and 80% of that fee goes directly to the Department of Natural Resources Wildlife Resources Division. The department supports the Georgia Wildlife Conservation Fund, the Bobwhite Quail Initiative and Georgia's trout conservation and management programs.